Saturday afternoon I visited the Oregon Flock & Fiber Festival and had a wonderful time watching all of the demos, petting tons of yarn and fiber, ooo-ing over the exhibits and chatting with all of the animals. There was an angora bunny that bore an incredible resemblance to a white tribble that I really wanted to bring home to use for a foot warmer. But I restrained myself, knowing that it would probably bring out the worst in the fur kids. (Phoebe jealously guards “her” bed.”) I also restrained myself while wandering through the vendor’s area. I didn’t buy anything. The problem was I wanted to buy everything, and I just couldn’t narrow it down. And toward the end of the afternoon, I started feeling sort of blah. By Saturday evening, I was feeling more than blah. I was feeling sick. Fortunately, between the time I got home from OFFF and the time I collapsed, I managed to concoct a large veggie stew from tomatoes, winter squash, lima beans, green beans, onion, garlic, carrots, bell peppers, celery, broccoli, corn, miscellaneous herbs and spices, elbow macaroni, and probably a few other things that were lurking in the veggie bin that I can’t remember right now. So I had a nutritious meal available any time that required no more effort than ladling out a bowl’s worth and nuking it in the microwave. And I learned another pleasure inherent in having a two-driver family. #1 Son could run up to the vet’s on Sunday to pick up cat food and I didn’t have to budge from the semi-prone position that was about all I could manage at the time. I haven’t read any blogs. I obviously haven’t blogged myself. 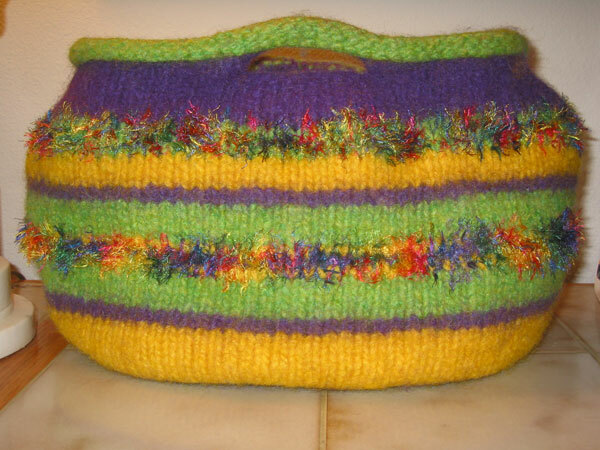 I did a bit of knitting, but not a lot. 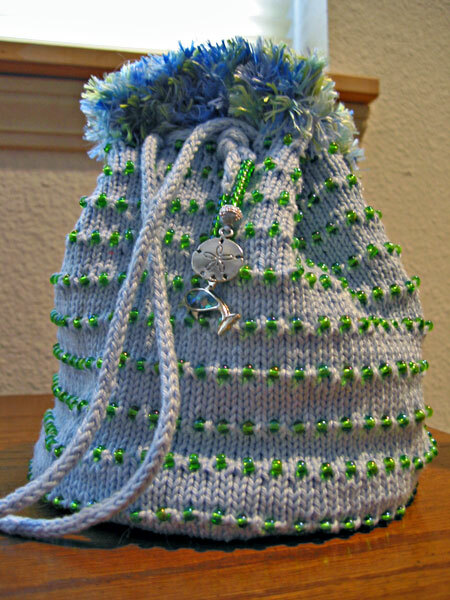 I haven’t gotten the latest FO’s added to the gallery. I haven’t progressed any in Myst V. Blech. I hate being sick. School started for #1 Son this week. He informed me in a quite dignified manner that there was no need for me to wake him up in the morning. “I’ve got it covered, mom,” he said. And he has it covered. I haven’t had to wake him up at all. And that’s such a pleasant departure from “the old days” when I could barely pry him from his bed in time to get to school. What a world of difference the summer has made. Just to prove that I’ve not been idle, here’s a new finished object to show off. This is a large-sized “buttonhole bag“. 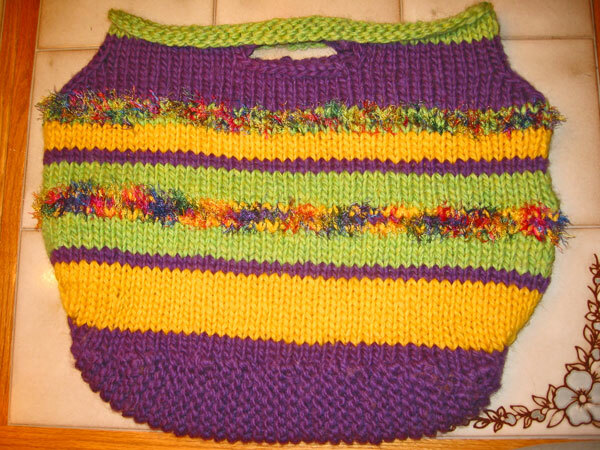 It was knit with two strands of chunky wool yarn on size 15 needles. I’m not overly fond of fun fur and eyelash, but I thought a little bit would add a fun funkyness to the whole rather retro color scheme. The top pic is pre-felting and the bottom is the finished product. (Click on either pic for the larger sized version.) I felted it in my front-loader (YEA! ), and I’m glad to know that I can actually do that successfully. I could have felted it harder and lost all stitch definition, but as you can see from the bottom pic it’s hard enough to stand on its own. I encouraged the top to roll because I liked that look. I still need to add a lining. The finished bag is large enough (about 17″ at the widest) to make a nice-sized project bag so I want the lining to include a few little pockets to hold sundries.. In other news, the grapes are ripening and I’ve picked several pounds to give away to friends. I managed to save almost all the harvest this year from the furry little black-masked bandits that have robbed me the last two summers. I grow the variety Himrod, and have two vines on an arbor over my back patio against the south side of the house. Because I’m on the north side of the hill, the growing season in my yard starts late and is slightly shorter than the valley floor. Himrod is an early variety, but I don’t usually have ripe grapes until the end of September. This year the abundant sun and warm weather helped them ripen about a week early. The good news is that the harvest usually extends for several weeks, so hopefully I will have enough time to deal with the crop. My grapes grow under my usual gardening philosophy of benign neglect. The grapes get nothing: No water or fertilizer, no spraying. Nothing. I whack them back a couple of times a year to keep them from taking over the yard and tearing the house apart and I harvest the crop when it’s ripe. That’s it. The two vines, each the size of small trees, reward me yearly with bountiful crops of some of the best grapes I’ve ever eaten. On Tuesday, #1 Son and I completed a road trip that took us some 1300 miles through 3 states in 4 days. I was sooooo glad to get home and sit in a chair that wasn’t traveling 20 MPH down a highway. Since #1 Son’s school doesn’t start until almost the end of September, I had decided to postpone my summer vacation until after Labor Day: kids in school, shorter lines, less traffic, better prices, etc. But Labor Day came and went and Vacation Day loomed without any clues about where to actually go. Finally, two days before leaving, I asked #1 Son to pick a direction and we’d just do a road trip. “East,” he said, and so east it was. Day 1: Off to a late start, 2:30 PM found us just wrapping up lunch at Edgefield. Well… it is east of home. From there we headed out the old Columbia Gorge highway to Crown Point Vista House. I haven’t been there for many years and I was amazed at the changes that restoration brought. Very cool and well worth a short journey from Portland. The other nice thing about the old highway is, of course, all of the beautiful waterfalls that you get to be up close and personal with. It’s a much more satisfying, albeit slower, trip than I-84. Nothing like that happened this time. Just after finishing my sad tail of long-ago woe, we stopped at a rest stop to “rest.” Four deer crossed the exit right in front of us. Because we were driving the Prius and it had switched to silent stealth mode, the deer weren’t frightened by any noise and we were able to watch them for a long time. A truck pulling a boat scared them finally and they ran off. In Baker City we decided we’d had enough fun for one day, ate dinner and found a place to rest our weary heads for the night. Day 2: From Baker City we kept heading east. But there’s a lot of east, and until you hit the Rockies a lot of it looks alike. Not that I don’t like the desert — I do, very much — but it’s not the most scintillating scenery ever. Cousin M lives in Lewiston and might not be too put off by a surprise visit. So at Ontario we turned left and headed north on US-95 along the Little Salmon and Salmon Rivers to Lewiston. At Whitebird I pointed out the old highway that snakes down the mountain in hairpin turns for miles and miles. As a newly-minted driver, I drove that highway in a fog so dense I could barely see the road ahead. It was probably a good thing. (My mama: You can’t drive this road! My dads: She’s doing fine. Let her drive. [he then put his had over his face and went to sleep while mama panicked in the back seat]) When I reached the bottom the fog lifted. I turned back and looked up at the road I’d come down. Then I pulled over and asked someone else to drive. I felt sick to my stomach. #1 Son thought the old road looked like fun. This driver was glad that the new road is straight and relatively boring. Cousin M’s birthday was the next day, so she said we were her “birthday present” when we showed up unexpectedly. And we had a very nice evening chatting and catching up. Day 3: From Lewiston north to Colfax, then a left turn across the middle of Washington, over Snoqualamie Pass and to Seattle. Lots of long, long, straight stretches of road on I-90. The pass was lovely, though. Negotiating the Seattle rush-hour traffic as quickly as possible, and with only one wrong turn thanks to GPS Navigation, we made it to the Bainbridge ferry with time to spare. From the ferry we drove across Bainbridge and then up and across the Hood Canal bridge to Sequim. We were tired. It was dark. We found a place to crash and slept. Day 4: With a few stops along the way to check out various points of interest, we followed US-101 around the Olympic Peninsula and down the Washington coast, then across the Columbia to Astoria. We made another left turn at Astoria. (Sometimes this seemed like a car race: Drive fast, turn left.) Then it was a short sprint along OR-30 home. The fur kids were glad to see us. We were glad to see them. I was happy to sleep in my own bed and not have to drive anywhere the next day. Pics will be up somewhere as soon as I get around to it. The Prius, I am happy to report, averaged 53 miles-per-gallon over the trip. This was the first road trip during which #1 Son was a legal driver. I really appreciated turning over some of the driving to him while I knitted. The “secret project” is coming right along and should be finished on schedule!